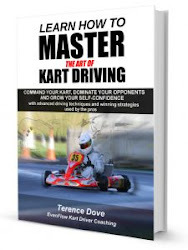 It's absolutely instructive to karters because it is about going as fast as you can on a well learned track on a very simple machine. Did you miss it????? Taking track notes is so important to Lizzy Yarnold's success that she felt absolutely compelled to update her notes after her gold medal run before celebrating the biggest result possible in the sport. She didn't drop everything and get carried away with the euphoria of conquering the world, she was so wrapped up in her secret to success that she sat down with pen and paper and wrote down what she learned about the track. When you take notes you have a blueprint for how to get around a lap pretty well. BUT, you also mark on your notes some question marks that mean 'I reckon I can go quicker here'. Then the process starts over. Every time you head out on track you aren't driving round in circles trying to avoid mistakes. And when you drive like this, your mindset is completely different - you are highly motivated to find time in a very specific and methodical way - you are driven by this motivation and your sessions fly by.